There are a number of Children's University events available to be booked onto. All events must be booked through schools unless specified otherwise. During this session we introduce children to the important role their feet have for many of their favourite activities, introduce them to the names of the bones involved and discuss the role of a podiatrist. They will complete a workbook that they can take home, part of which records their data and graph from an investigation we run with them into ‘whether taller people have bigger feet’. Usually, we all enjoy these activities and have lots to discuss throughout the session. In this workshop, students will rotate around a series of activities connected to a crime scene. The activities include fingerprint analysis and reconstructing the human skeleton. Changing how children view the outdoors and getting them to be creative with what’s around them! Aimed at the younger years. In this workshop, students will explore a variety of animal and insect specimens from our planet. The specimens will be set out as a quiz so that students can see how much they know about the animals we share the planet with. David will take us on the journey of how he became a writer to enthuse and inspire his audience to read more books and write more stories. In this workshop students will explore a variety of animal and insect specimens from our planet. The specimens will be set out as a quiz so that students can see how much they know about the animals we share the planet with. Urban Buzz are going to work with local communities to encourage even more bees, butterflies, hoverflies and other insect pollinators to sites across Plymouth, and bring a little bit of the countryside right into the city centre. Primary Schools are invited to take part in a range of interactive exhibits in our marquee including (but not limited to! ): robotics, oculus rift, maths with bubbles, building kit cars and much more! In this workshop students will rotate around a series of activities connected to a crime scene. The activities include fingerprint analysis and reconstructing the human skeleton. Event for school coordinators to find out about opportunities throughout the year. 11:00–14:00 – Sherwell Centre, University of Plymouth – No need to book, just show up. 17:30–19:30 – Devonport Lecture Theatre, Portland Square Building, University of Plymouth – Showcasing the studies of science, past, present and future, and looking at how technology has shaped our understanding of the natural world. Teddy Bear Hospital Workshop 16.15–17.15 (5–10 years) – the children will become Junior Teddy Medics and run through a number of role plays and interactive stations. Medical and Dental Workshop 17.20–18.20 (11–14 years) – the Medical and Dental Workshop is a fun and interactive session. Children can come along to learn about and take part in a number of hands on activities with our own medical and dental students. Demonstration of a University robot and an interactive coding session, teaching your robot to move! Come and help build a bug hotel. We will be making small bug bedrooms and putting them together all on the same day. As part of National Gardening Week join in a big spring clean of Drake’s Place gardens and get some tips on planting up hanging baskets and containers – and as a thank you for your hard work there will be cake. Be part of an instant art exhibition. Learn to use a camera, take pics of DPG, print them out and install them in the colonnade gallery all in one day. Demonstration of a University robot and an interactive coding session, teaching your robot to move. In this workshop, students will participate in a series of activities to test their senses. *This workshop involves the use of food colouring. Making green man masks and flower masks to celebrate the coming of summer. This workshop will take place at Heartlands in Cornwall - Please email us to book your individual place! We will look into the effect of microplastics in our oceans at the Marine Station at the University of Plymouth, please email us to book your individual place! We will be building a mini Tudor Plymouth and installing it in the gardens – come and join in – 10:30–14:30 – Drakes Place Gardens – No need to book, just turn up. We will look into the effect of microplastics in our oceans at the Marine Station at the University of Plymouth, please email us to book your individual place. 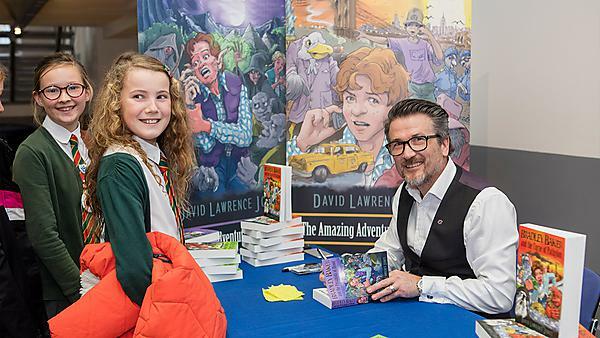 David will take us on a journey of how he became a writer in order to enthuse and inspire those attending to read more books and write more stories. Devon Children’s University Graduations at the University of Plymouth – Thursday 4 October 2018. 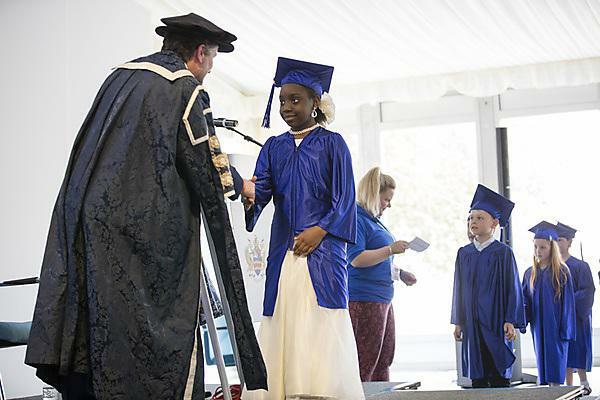 Devon Children’s University Graduations at the University of Plymouth – Friday 5 October 2018. Schools can choose from a number of different workshops, please email us for more information. Mathematics the burglar – a hand print has been discovered at the scene of a burglary. Can you help recreate the burglar just from the hand print? Music has long been linked to technology – from early bone flutes found in caves, to pianos with thousands of precise parts, to electronic synthesizers. This workshop explores the fundamental relationship between music and technology, and addresses the question: does music influence technology, or does technology influence music? Using the MITAppInventor students will be immersed into mobile app development. The platform is free and students can continue using it once they go home and/or at school premises. We will provide you with iPads or you can bring your own. You will be exposed to iOS development by using Playgrounds which is suitable for children of the age of six. During the workshop, we will explore how to make simple applications and give you guidance on how to find more information in your own time. This workshop will also be ideal if the schools have invested in iPads and would like to see what else they can do. No need to book, just turn up to this make and take event from 11:00–14:00. Learn more about rocks and fossils and how to distinguish which ones are which, by looking at their properties! The activities show what research tells us about how memory works and how we can create a prosocial environment. Please email us to book your individual place. Explore outer space with our Immersive Vision Theatre! We will provide you with iPads or you can bring your own. You will be exposed to iOS development by using Playgrounds which is suitable for children of the age of six. During the workshop we will explore how to make simple applications and give you guidance on how to find more information in your own time. This workshop will also be ideal if the schools have invested in iPads and would like to see what else they can do. Book and come along for free, to this year's Children's Christmas Lecture. For 7 years old and up, let us enlighten you in the science of light, colour and vision in the natural world. With talks from scientists from the University of Plymouth, City College STEM Centre, Plymouth Marine Laboratory and Plymouth Museums Galleries Archives, this is a festive event not to miss. Refreshments are provided on arrival from 17:30, and there is the chance to get hands on with some of our exhibits and chat to the scientists before the talks begin. David will take us on the journey of how he became a writer to enthuse and inspire his audience to read more books and write more stories! History talk – Learn more of the Salem Witchcraft Trials in this exciting talk. Learn more about rocks and fossils and how to distinguish which ones are which, by looking at their properties. History talk – learn more of the Salem Witchcraft Trials in this exciting talk! Get all the way up to 100 stamps and we will give you a gold certificate, and not just that, we will invite you and your family along to the University of Plymouth where you will have a graduation! Philippa Oxley, Third Floor, Nancy Astor Building, University of Plymouth, Drake Circus, Plymouth, Devon, PL4 8AA.